Beth Hart is the workhorse of blues’ American women – if workhorses write songs with Slash and tour with Joe Bonamassa, that is. In the nearly 20 years since Hart launched her solo career with Immortal, Hart has released six additional solo projects, including two DVDs, and collaborated onstage and in the studio with musical giants like Buddy Guy and Jeff Beck. This spring, Hart adds another album to her resume with Better Than Home. 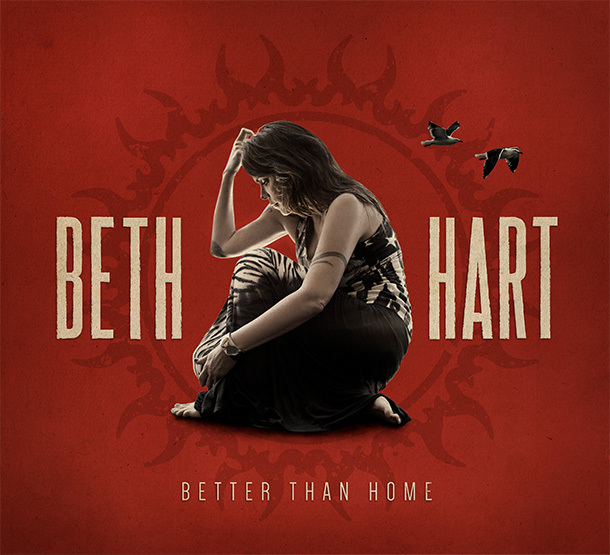 In a way, Better Than Home is classic Beth Hart. Each song is fueled by the power and intensity of her voice, with her blues background never far from the surface. While Hart rocks hardest in “Trouble,” tracks like “The Mood That I’m In” and “Might As Well Smile” keep the tempo up and allow Hart room to stretch her voice. Piano accents add delicacy to Hart’s soothing vocals in “We’re Still Living in the City” and “As Long As I Have a Song,” while “Mechanical Heart” benefits from orchestral accompaniment. Hart explores new realms on Better Than Home, both creatively and production-wise. In addition to balancing sensitive songwriting topics with moments of hope and reflection, Hart also found new producers in Michael Stevens and Rob Mathes, both of whom Hart met after performing at the Kennedy Center Honors in 2012. Slated for release through Mascot Label Group on April 13 in Europe and April 14 in the U.S., Better Than Home shows Hart moving forward as a musician and songwriter.